Copwatch is a Windows client for the IPCop firewall. It displays an icon in the system tray and popups that show information about the connection status of an IPCop firewall. If the mouse is placed over the Copwatch icon in the system tray, a popup with detailed status information is displayed that gets updated once every second. Copwatch can also display automated popups on connect, disconnect or errors. To display it, right click the Copwatch icon in the system tray and select 'Options' or launch Copwatch from the Start Menu. To open IPCop's interface in your browser, left-click the Copwatch icon in the system tray. Select 'Connect' or 'Disconnect' from the tray menu (right click Copwatch icon). To use 'Connect'/'Disconnect', you need IPCop's Dial user password. If you have not already defined it, use IPCop's web-interface and go to 'System->Password->Dial user' to configure it. The option 'Ping after Connect' is for dial on demand users, it sends a ping after 'Connect' is selected to trigger the connection. 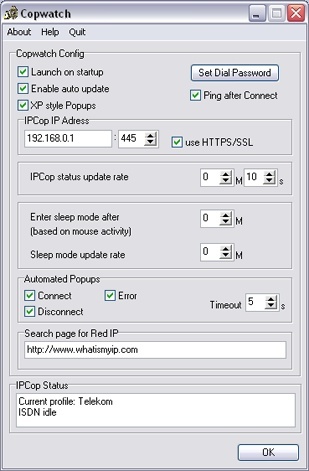 To display IPCop's red IP-address, select 'Red IP' from the tray menu. Copwatch will connect to the website specified on the options tab and display the first IP-address it finds. Copwatch reads the HTML status page from your IPCop firewall. Q: Why can't Copwatch find my IPCop firewall? A: Make sure you don't have any software firewalls installed that are blocking Copwatch from accessing IPCop. Q: Why is Copwatch not showing the XP style popups or any automated popups? A: Copwatch uses Windows Balloon popups to show the (automated) popups, make sure they are not disabled on your system. Q: Why is Copwatch only showing "Missing connection data or unsupported language"? A1: Copwatch requires that your IPCop's status page displays information about the current connection. Check here for details. If your IPCop is setup with network cards only, Copwatch will not work. Some cable modem setups may not work either. A2: Your IPCop is set to an unsupported language, try using a different language setting on your IPCop.